When you have all these done, you may now send and receive text messages from your Chrome browser after these simple steps. 1. Open the MightyText app on your phone. It will ask you which Google account you want to associate the app with. Choose your Google account and hit Next. The app will sync with the account and should allow you to hit on the Finish button on the next screen. That’s it! You’re done with your phone’s setting. 2. 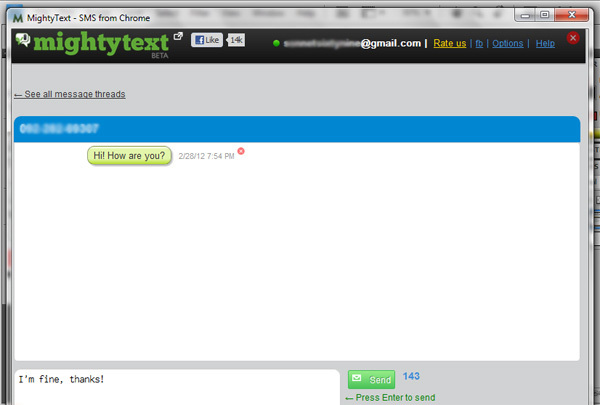 On your browser, go to the Chrome Web Store and download MightyText extension. *Important: It’s imperative that you install the Android app on your phone first before downloading the Chrome extension. 3. You should now see the MightyText icon on the top right corner of your Menu bar. Click on the icon to open the MightyText app. It will give you a message and a link on the top of the page to log in to your Google account first. Click on this link and log in to your account. 3. 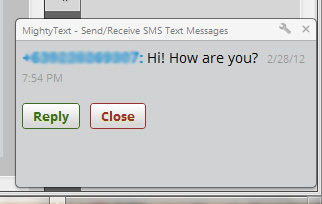 You should now start to receive pop-up notifications of incoming SMS. *Note: If your contacts are not stored in your Gmail account, the messages will not show the contact name but only the phone number. If you prefer getting the messages with the contact names shown, you should sync your phone book with your Gmail account. You may click the MightyText icon on top of your browser to toggle on and off this screen and go to other programs you’re working on. 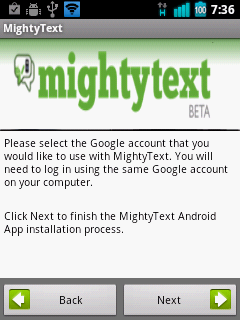 MightyText has a known issue with GoSMS. If you’re not receiving your SMS on your desktop, check this troubleshooting information from the developers. Overall, this is a very handy app for multitasking and other unique situations when you can’t pick up your phone.